Can’t we all just go home? I see you, fellow teacher, sitting in the back of the faculty, department, or staff meeting. It’s the end of the day, you’re exhausted, and the thoughts in your head aren’t exactly positive and glowing. They might not even be “school appropriate,” as your administrator goes on in great detail about the new rules for monitoring the state-mandated tests. With that in mind, here’s a helpful guide for keeping your communication sounding professional and upbeat, even if what you’re thinking isn’t quite so cheerful. “You better not come into my room and tell me that, if you know what’s good for you! Nothing. You keep kids quiet and on-task all day long. It’s their turn now. We hope you find this handy guide helpful as you head into your last few faculty meetings of the year, teachers! Let us know if we missed any essential positive communication translations in the comments! 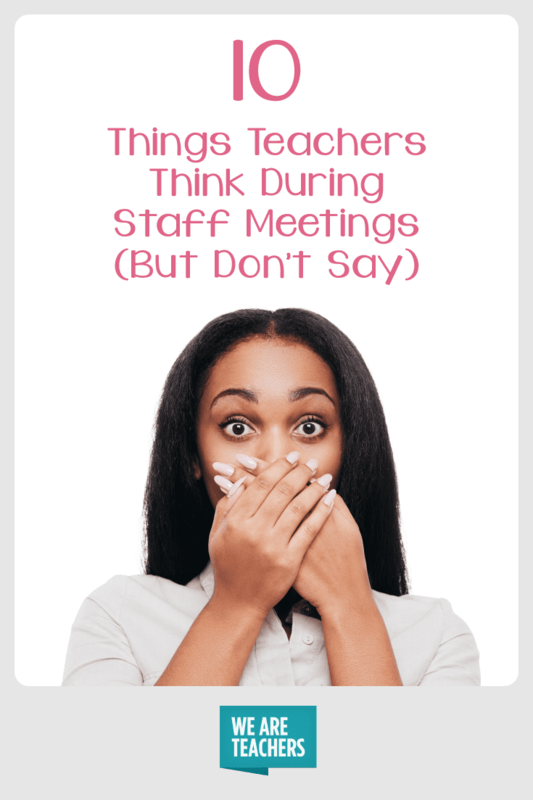 What are your staff meeting coping techniques? Come and share in our WeAreTeachers HELPLINE group on Facebook.